I’m super excited to launch a new weekly series on my blog called “Getting to know… a fellow blogger!" I have always been interested and inspired by how other bloggers got their start, what inspires them and what their advice is to other fellow bloggers like me. To tap into that curiosity, every week I’ll be featuring a fellow blogger that I admire by asking them a series of questions that will hopefully introduce you to them or allow you to get to know them better. LilBitsofChic:I’ve always been a creative person, however over the last five years working a full time job and working with numbers all day took its toll. One night I felt I had so much creativity pent up that I started painting frantically. One painting turned into 3 and I figured "I should document this on a blog". I started blogging about my paintings but my other passions for fashion and photography kicked in and here we are. LilBitsofChic: In my spare time I am usually relaxing from a busy day at work, walking my dog or spending time with family, boyfriend and friends. I also enjoy painting, surfing the web for ideas and checking out other blogs. What has been your favorite part about having a blog? LilBitsofChic: My favorite part about having a blog is that it a forum to express myself creatively. The bonus is when other relate or like what I blog about. That makes me feel nice. What has been one of your favorite posts? 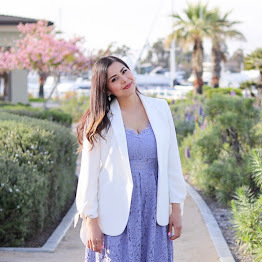 LilBitsofChic: My favorite post so far was the first fashion challenge I joined where the challenge was to wear an outfit inspired by a celebrity (click here). I loved that post because I stepped out of my comfort zone and it had a great response. LilBitsofChic: In a year, I hope that I am still as passionate about my blog as I am now. That it evolves with me to whatever stage in my life I will be at. I hope that it improves with time and that I get to know more bloggers. To you, what defines a successful blog? LilBitsofChic:To me, a successful blog is one that makes its creator happy. It's not about the money, it's not about the followers, it should be about keeping it 100% real and genuine. What would be your advice to someone starting a blog? LilBitsofChic: My advice to someone starting a blog is give every post 100%. By that I mean put in the time and effort that it requires to get your point across. My other piece of advice is to be supportive of other bloggers. It’s a whole universe of bloggers but it feels like a close-knit community when you start to support and get to know each other. LilBitsofChic: I want to thank everyone who has taken the time to visit, comment and/or follow my blog. I hope that you enjoy this series as I start to feature other bloggers. If you would be interested in participating feel free to email me at pauslilbits@gmail.com. Thank you! And as always…. ***P.S. don't forget to come back Friday for "Getting to Know... LovelyShopGirl!" Awesome series and wonderful post!! Wow I can't believe you have been blogging for only 4 months you are like a por ;) my blog baby turns one this week. I think this is a wonderful idea. OMG she sounds like me...I work in the Finance industry and also got so tired of numbers and spreadsheets all day long that I had to do something else in my free time! Thank you for introducing us to your fabulous friend..I'll be stopping by to say hi! Loved learning more about you :) Im a follower. I think it's a lovely idea and I really like interviews! :P btw, the colours of your outfits shown here are amazing!! Hi lovely,fantastic interview!!! I like it!! Thank you for introducing us to your fabulous friend. Great interview of yourself! I loved learning more about you!